It is official. Ebay is old news. Etsy is my new addiction. Etsy is a website dedicated to the buying and selling of handmade items. There is even a section where you can search for items made by people in your area. The people that sell on this website are really artists. Check out these fairy mushrooms. 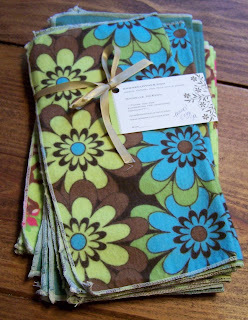 I bought the fabric napkins pictured above from a seller on Etsy. I wanted to upgrade from the wash clothes we had been using. I really wanted to make my own, but I saw these and they were so inexpensive I could not pass them up. Thanks Cristina! I have been using them for a week and love them. I love your blog. You find some great stuff!